A cylinder silver rod of length 1.17 m and cross-sectional area 4.76 cm2 is insulated to prevent heat loss through its surface. The ends are maintained at a temperature difference of 100 Cº by having gone end in a water ice mixture and the other in boiling water and steam. 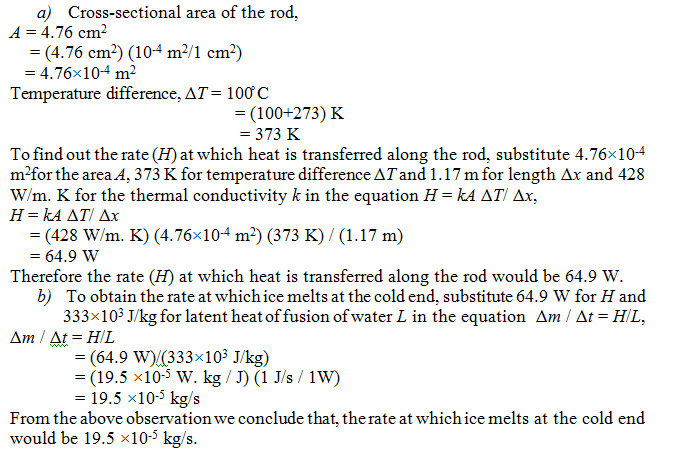 (a)  Find the rate at which heat I transferred along the rod. (b) Calculate the rate at which ice melts at the cold end.